In addition to the release of the Rutherford appellation 2007 vintage, there was vertical tasting of the 03, 05, & 06 Cabernet Sauvignons. All were priced the $85-$100 range. And all had high point ratings awarded to them from the usual wine rating suspects. But I try to ignore the numbers when I’m first trying a wine. I found the 03 unbalanced, and rather quirky. I had a difficult time getting the nose on it and the finish was elusive as well. Over the course of a few hours I tried it several times and it was completely different at each taste, but still not appealing to me. The 05 was more to my liking, fuller with big fruit flavors and a long finish. I loved the 06. It was earthy and flinty almost dusty, with pronounced tannins. But the 2007 from the Rutherford appellation was my favorite. Maybe I just like young wine, but I found it bold and balanced. I detected chocolate and tobacco notes with a kind of flinty fruit flavor. Provenance Winemaker Chris Cooney agreed the 03 was challenging for some people and noted that that’s the whole point of tasting wine, to find what you like, not what someone tells you to like based on a rating. He admitted, of course, that all winemakers seek to get third party recognition and acknowledgment to give their wines a wider audience. But the ratings game is just an undeniable part of wine making. “Really? The flavor is most unusual for pork.” I said. It was hard to really see the mysterious protein as it was completely coated in the balsamic and cabbage, and I wasn’t 100% convinced it was pork, but the woman was so adamant that it was. I kept tasting it and puzzling over it. “Are you sure this is pork?” I asked one more time. And the lady shot me an exasperated look and said. “Honey, I’m telling you this is pork. I make this recipe all the time. It’s PORK!” And then she got up and left in a huff. So I took her word for it that it was pork and gobbled up the rest of it. Then later, my husband and I went up to Chef Altman to ask him about the recipe and most of all to find out where he purchased the pork. For it was exceptional indeed. And as soon as he said “duck” it was like a flash of insight. Of course it was duck!! But I’d gone against my instincts and stopped trying to determine what it was when the lady at the table insisted it was pork. I worried I might have a deficient fat receptor in my palate and made a note to myself to seek out the duck experience more often. (For research purposes of course.) But more troubling was the fact I let someone else’s opinion override my own sensibilities. And I realized how the power of suggestion, and the power of numbers, by way of rating points, can sometimes carry you off track. So judge according to your taste, based on your own criteria, whatever it is. Trust your own palate! Even if you are wrong! After all, you know what you like. 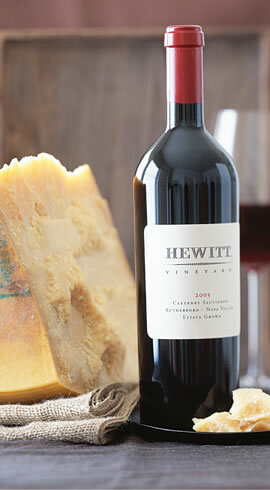 But be it pork or duck or baloney, I think the 07 Hewitt Cab would pair perfectly with it. Then again why would you take my word for it? Go try it for yourself.